A few weeks ago, in honour of International Women’s Day, I made and shared this meme over on Instagram. I received a few private messages both on Insta and via Facebook from followers and friends who subscribed to this ethos of balance but quickly became clear that there are more than a few mums who also detest Mother’s Day for the commercial explosion. 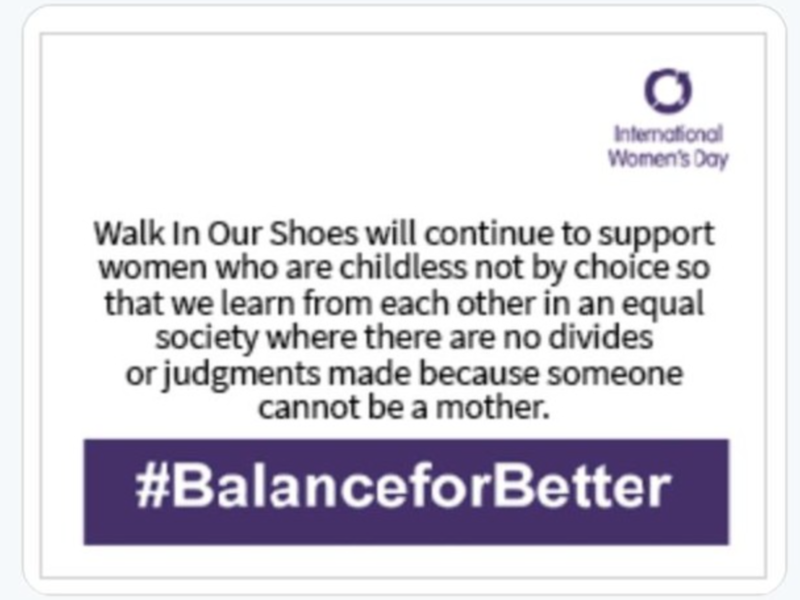 The ‘balance for better’ phrase felt important, because the solidarity of International Women’s Day can often be destroyed by Mother’s Day hype. With miscarriage being the most common complication of pregnancy, ending 250,000 of pregnancies in the UK, it’s not just those of us who are childless not by choice or going through fertility treatment who find this tough. It’s also really hard for those who have lost their mum too or have a painful or non-existent relationship with them. A friend who has two sons and lost her mum, observed that it was difficult with boys and wondered if a daughter might mean the day was noted in her house. Many friends who lost parents but had children found it upsetting at times in their lives. It does beg the question why Mothers Day at all? It might interest you to know that the day was originally a festival for the Greek and Roman mother goddesses Rhea and Cybele. In the UK the early origins have little to do with ovaries and focus on the church. Girls in servce were allowed the day off to visit their mother church, the place they were baptised or worshipped in. In the USA, Ann Jarvis formed clubs to help mothers with their babies. These later became friendship circles. Her daughter, Anna Jarvis who was unmarried and childless, created a day of celebration to honour her mother’s work and the sacrifices made by mothers to bring up children. The letter writing campaign she began to raise awareness was a success. Mother’s Day was added to the National Calendar of events in the USA. By 1912 in many states it was a national holiday. But Jarvis was appalled at the commercialism of the day. In 1920 she had taken out several lawsuits against groups using Mother’s Day as a business name and tried to get the day removed from the calendar. The old me, the one before IVF failure, spent this day in hope. Once or twice I was newly pregnant and unable to share for fear of destroying hope. So it is a time when I am struck with sadness, more so than Christmas where the challenge to be happy and joyful is shared. One year I completely forgot about it. It was between my third and fourth cycle of IVF when I still had some strength left. I invited my family and friends to Aldeburgh, a beautiful town on the Suffolk coast for a birthday celebration when I still honoured my years. I had completely forgotten that, as they went home, that it was also coming up to Mother’s Day weekend. On the Sunday after the party, I went to the pub with my husband and realised we had no hope of getting a table when I saw the balloons and banners celebrating what I could not do. My mum was now at home, some 20 miles away. That was 8 years ago and the first time it really felt like I was being excluded. It hurt so much. If ignoring it doesn't work then what does? Below are some ideas works for me and what I have learned from others. I’ve been honest with my family (even if they maybe don't always listen). Giving yourself the space to say no is okay. One other piece of advice I had in counselling was go to events ‘on your own terms’. If you want to visit family but aren’t sure how you’ll manage, pop in. Arrange something even if that’s as simple as chatting to a friend in our community, or even invent a diary date if you must (watching re-runs of Pride and Prejudice is a date in my opinion). Then you have a time limit and a good reason to keep your distance. Much like how I ask about frogs each Monday in the Walking Forward Inspirational Network, tackle this as a frog you don’t want to do deal with and give yourself a reward at the end. Take your mum out on another day, perhaps after Mother’s Day. It maybe easier to bear. Less families and more peace. Those who listen may not completely understand but it won’t come as such a shock when you say you can’t do the big family lunch and offer up an alternative. Fortunately my mum doesn’t like the faff but I do feel sorry that I let her down each year with a card shoved in the post and not much else. I often spend Mother’s Day in the garden. My solace is found in the bath that soothes the backache from a day of digging and the happiness of knowing I have buried seeds in raised beds waiting to sprout organic veg and the thrill of flower bulbs which will entertain the bees and decorate my house this summer. In other words, a distraction. I have also bought a pile of books to read (Islander by Patrick Barkham and Owl Sense by Miriam Darlington ) so I’m not dragged into the internet. I’ll be online to check in on friends but mostly not on spaces which can trigger. Write down how you feel and have a rant with a foot selfie for me on this website or share what you know and inspire others. I often work on this website or other childless campaigns as a way of correcting the balance. Keep in mind that at the heart of all this stuff is commerce. In the USA, people spend $23.6n on gifts but that is helping to prop up a lot of small businesses. Say a big thank you to the companies who are providing opt outs. There’s a hashtag on Twitter and Instagram called #notomothersdaypr and so far I’ve listed Bloom and Wild, Marks and Spencers, Isles of Scilly Flowers, Superdrug and Pump Street Bakery as companies who have acknowledged it’s tough. You can read more here and I’m still emailing anyone who dares to promote in my inbox. It’s very cathartic! My best advice is to accept it’s not going to be easy and celebrate the small wins. Warn those around you that you may find it hard. Buy a large box of chocolates and turn on Netflix or switch off the modem, dig your garden or connect with others. But it is one day and it will pass my friend. And if you feel it’s too much, join one of many support groups or track me down on social media. Let’s have a grumble together. You are not alone.